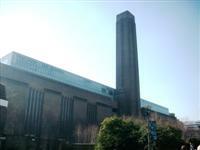 Tate Modern is Britain's national museum of modern and contemporary art from around the world, housed in the former Bankside Power Station on the banks of the Thames. The awe-inspiring Turbine Hall runs the length of the entire building and you can see amazing work for free by artists such as Cézanne, Bonnard, Matisse, Picasso, Rothko, Dalí, Pollock, Warhol and Bourgeois. 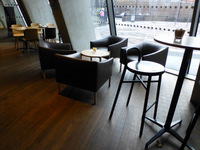 Services / facilities within the building include galleries for permanent and temporary exhibitions, cinema, gift and book shops, cafés and restaurants, members' room. Related link Link to the gallery accessibility information. 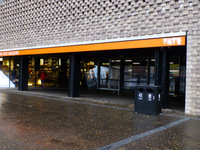 Related link Link to the Tate restaurant page with links to the other cafes and bars and their opening times. The building is in two sections - the original Boiler House facing the Thames and the new Blavatnik Building at the rear. . The two parts are connected on Level 0 through the Turbine Hall and by the Level 1 Bridge and Level 4 Bridge. The nearest National Rail station is Blackfriars. The nearest underground station is Southwark. The nearest DLR station is Bank. 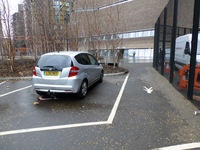 You are on Parking (Blue Badge Only Parking). Skip to the next section. 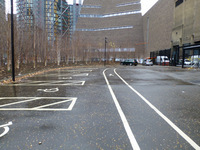 The car park is located off Park Street. 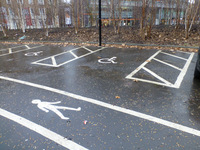 The dimensions of the Blue Badge parking bay(s) are 360cm x 600cm (11ft 10in x 19ft 8in). The nearest Blue Badge bay is 30m (32yd 2ft) from the South entrance/ Blavatnik entrance. 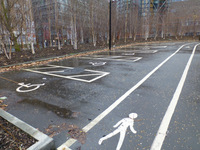 The furthest Blue Badge bay is 65m (71yd 3in) from the South entrance/ Blavatnik entrance. 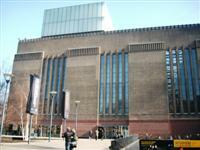 To reserve a parking space, email ticketing@tate.org.uk or call 020 7887 8888. You are on Outside Access (River Entrance). Skip to the next section. This information is for the entrance located at the front of the Boiler House building, facing the Thames on Queen's Walk. This entrance gives access to level 1 of the building. You are on Outside Access (level 1 West Entrance). Skip to the next section. 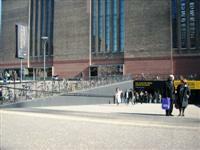 This information is for the entrance located on the west side of the building, to the left of the Turbine Hall entrance. 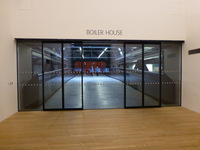 This entrance gives access to level 1 of the Boiler House building, next to the Café . You are on Level Change (Level 1 West Entrance). Skip to the next section. 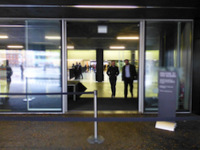 You are on Outside Access (Turbine Hall Entrance). Skip to the next section. 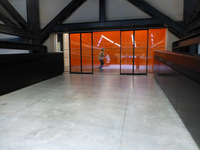 This entrance gives access to the Turbine Hall on level 0, via a steep ramp. You are on Level Change (Turbine Hall Entrance). Skip to the next section. The ramp/slope is located leading down to the entrance and inside the building after the entrance. The step(s) is/are located to the right hand side of the ramp as you enter the building. 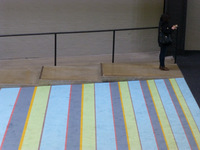 The striped carpet on the ramp was part of an artwork at the time of our visit (January 2018) and is likely to change. 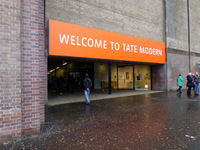 You are on Outside Access (South Entrance). Skip to the next section. This information is for the entrance located on the south side of the building from Sumner Street. 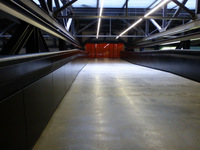 This entrance opens directly into the level 1 bridge link over the Turbine Hall. You are on Outside Access (Blavatnik Building Entrance). Skip to the next section. This information is for the entrance located on the south side of the building, off Sumner Street. The width of the door opening is 210cm (6ft 11in). This entrance opens into level 1 of the Blavatnik Building for lifts and stairs to the upper floors, including the level 10 viewing gallery. After the first set of doors there are double, heavy doors, 175cm in width, to the left of the lobby into the Terrace Bar. 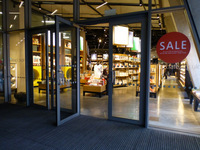 To the right of the lobby there are double doors with one leaf locked (87cm) into the Terrace Shop. 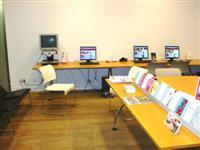 You are on Reception (Information and Multi Media Guides). Skip to the next section. 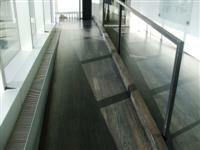 The desk/counter is 15m (16yd 1ft) from the River entrance on level 1. 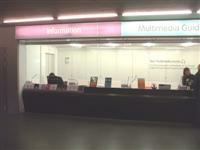 There is also an Information and Ticket Office located on level 0 to the side of the Turbine Hall. This also has a hearing loop fitted. You are on Reception (Cloakroom). Skip to the next section. The desk/counter is 20m (21yd 2ft) from the Boiler House lift. The desk/counter is low (76cm or lower). The cloakroom is located on level 0 of the Boiler House, just past the escalator. The hearing loop is fitted in the Starr Cinema on level 1. 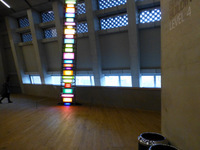 Hearing loops are also available for most gallery tours. Exhibits can be audio described. The availability of tactile signage depends on exhibition. A deposit is not required for the hearing system. 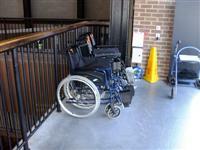 To borrow the wheelchair, contact a member of staff. Two electric scooters are also available. Accessible facilities include: large print gallery plans, large print guides, magnifiers and coloured overlays, audioguide, touch tours (booking required), audio described tours delivered by visually impaired artists. (hearing loops and amplifiers are available), BSL talks, multi-media guide (a handheld computer plays video clips of interpreters signing a tour of 14 highlights of the displays). You are on Other Floors (Boiler House). Skip to the next section. The floors which are accessible by stairs are 0, 1, 2, 3, 4, 5 and 6. 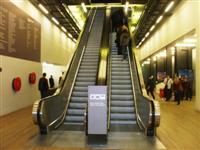 The floors which are accessible by escalator are levels 0,2,3,4. The foot and head of the escalators are clearly marked. 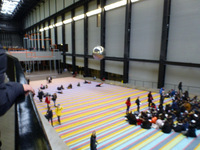 Note that from the Turbine Hall the escalators go directly to level 2. You are on Lift (Boiler House). Skip to the next section. The lift is located at the front of the Boiler House building, next to the stairs. 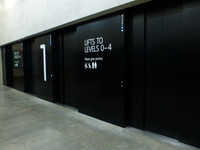 The floors which are accessible by this lift are 0, 1, 2, 3, 4, 5 and 6. The lift is approximately 33m (36yd 3in) from the River entrance. The dimensions of the lift are 123cm x 192cm (4ft x 6ft 4in). There are 4 lifts available, and priority is given to people with mobility impairments and pushchairs. You are on Other Floors (Blavatnik Building). Skip to the next section. The floors which are accessible by stairs are 0, 1, 2, 3, 4, 5, 6, 7, 8, 9 and 10. You are on Lift (Blavatnik Building). Skip to the next section. The lift is located ahead from the Blavatnik Building entrance. 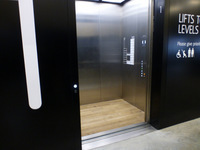 The floors which are accessible by this lift are 0, 1, 2, 3, 4, 5, 6, 7, 8, 9 and 10. The lift is approximately 10m (10yd 2ft) from the Blavatnik Building entrance. The dimensions of the lift are 150cm x 140cm (4ft 11in x 4ft 7in). There are 8 lifts in this location. The four lifts to the right of the lift lobby serve floors 0 to 4 only. The four lifts to the left serve all levels. 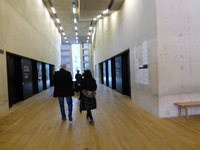 There are also a further two lifts serving levels 0 and 1, linking the Blavatnik Building entrance with the Turbine Hall. You are on Level Change (Level 4 Bridge Link). Skip to the next section. 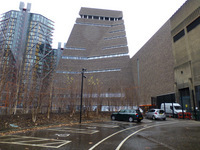 The ramp/slope is located on the brige, linking Blavatnik Building with the Boiler House. There is a glass screen with two sets of automatic sliding doors at each end of the bridge link. You are on Level Change (Level 4 Boiler House). Skip to the next section. The ramp/slope is located in the main open area of level 4. The width of the ramp/slope is 130cm (4ft 3in). The step(s) is/are located in the main open area on level 4. There is/are 6 step(s) to the area/service. 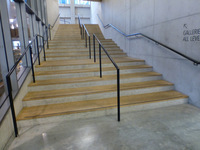 The ramp overcomes the steps mentioned, and has handrails both side. 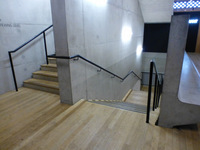 The ramp and steps lead down to the Interactive Area on level 4. 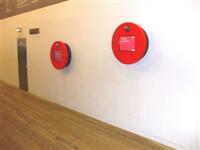 You are on Level Change (Members' Room - Boiler House Level 5). Skip to the next section. 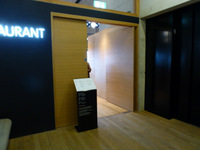 The ramp/slope is located next to the entrance to the Members' Room. The width of the ramp/slope is 99cm (3ft 3in). This ramp has a handrail on the right hand side going up, and leads to the balcony at the rear of the building. There is a similar ramp on the other side of the room, leading to the balcony at the front of the building. This ramp is wider than 150 cm, and has a handrail on the left hand side going up. You are on Eating and Drinking (Café - Boiler House Level 1). Skip to the next section. 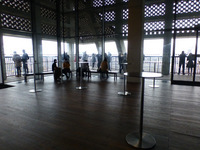 The café is located on level 1of the boiler house at the west end of the building. 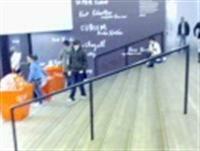 The nearest table is approximately 5m (5yd 1ft) from the café entrance. 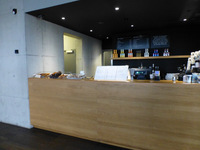 You are on Restaurant Bar Internal (Espresso Bar - Boiler House Level 3). Skip to the next section. 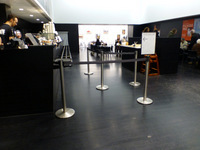 The nearest table is 5m (5yd 1ft) from the café entrance. 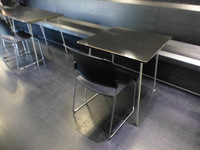 The distance between the floor and the lowest table is 74cm (2ft 5in). The type of food served here is sandwiches and snacks. 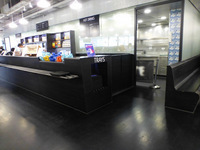 The Espresso Bar is located on level 3. 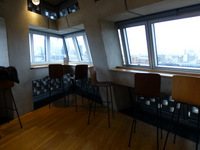 There is a similar café in the Members' Area on level 5. 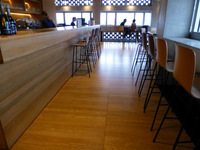 You are on Eating and Drinking (Kitchen and Bar - Boiler House Level 6). Skip to the next section. The restaurant is located on level 6 of the Boiler House. The nearest table is approximately 15m (16yd 1ft) from the lift. 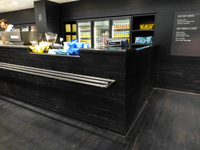 The type of food served here is main meals, drinks and snacks. You are on Eating and Drinking (Terrace Bar - Blavatnik Building Entrance - Level 1). Skip to the next section. The following information is for the café/bar. 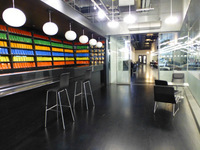 The café is located immediately to left after the Blavatnik Building entrance. The distance between the floor and the highest table is 109cm (3ft 7in). 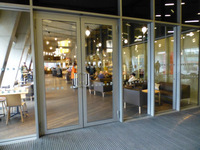 There is also a direct entrance from the terrace into the bar with automatic doors which may be in use in warmer weather. 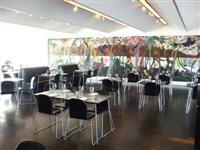 You are on Eating and Drinking (Restaurant - Blavatnik Building Level 9). Skip to the next section. 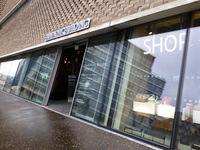 The restaurant is located on level 9 of the Blavatnik Building, to the right as you exit the lifts. 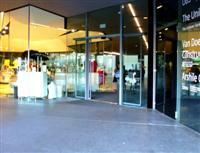 The nearest table is approximately 20m (21yd 2ft) from the restaurant entrance. The standard height for tables is 109cm. The type of food served here is modern European cuisine. 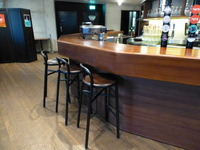 The photographs show the bar area leading to the dining area which has standard height tables. 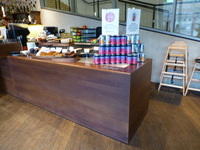 You are on Eating and Drinking (Coffee Kiosk - Blavatnik Building Level 10). Skip to the next section. 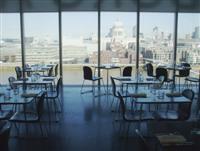 The café is located on the level 10 viewing gallery of the Blavatnik Building. The nearest table is approximately 5m (5yd 1ft) from the lift. 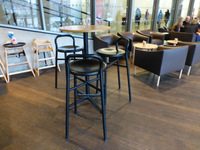 The standard height for tables is 120cm. The type of food served here is ===. 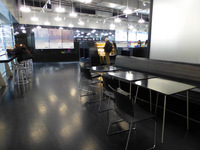 There are tall tables for standing use and some bench seating in this area. The facility is located in the toilet area on Boiler House level 0. The facility is approximately 30m (32yd 2ft) from the lifts. The key can be obtained from the cloakroom, located next to the toilet area. The dimensions of the facility are 350cm x 500cm (11ft 6in x 16ft 5in). 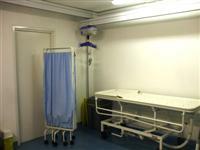 The length of the facility changing bench is 190cm (6ft 3in). The transfer space on the left as you face the toilet is 60cm (1ft 12in). The transfer space on the right as you face the toilet is 200cm (6ft 7in). Wall mounted grab rails are not available. You are on Accessible Toilet (Boiler House). Skip to the next section. 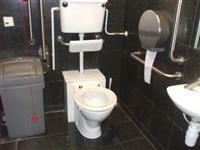 This accessible toilet is approximately 35m (38yd 10in) from the River entrance. This accessible toilet is located next to the lifts on level 1. The dimensions of the accessible toilet are 120cm x 230cm (3ft 11in x 7ft 7in). The lateral transfer space is 78cm (2ft 7in). 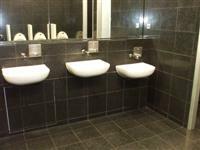 There are accessible toilets available on all other levels of the Boiler House,. You are on Accessible Toilet (Blavatnik Building). Skip to the next section. 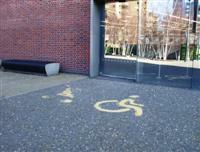 This accessible toilet is approximately 20m (21yd 2ft) from the Blavatnik Building entrance. 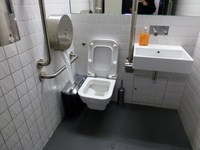 This accessible toilet is located off the corridor leading to the standard toilets, to the left after the entrance. The dimensions of the accessible toilet are 150cm x 270cm (4ft 11in x 8ft 10in). There is a second accessible toilet with the transfer space to the left at the end of the corridor after the standard toilets (photograph 3). There are further accessible toilets on all levels of the Blavatnik Building. You are on Standard Toilet(s) (Boiler House). Skip to the next section. The female and male toilet facilities that were surveyed are located next to the lifts on level 1. The female and male toilets are approximately 30m (32yd 2ft) from the River entrance. Baby change facilities are located in all standard toilets on all floors. The height of the baby change table once extended is 111cm (3ft 8in). There are standard toilets available on all levels. Some of the standard toilets contain cubicles with doors which open outwards. There is also a baby care room, located in the toilet area on level 0, shown in photograph 2. The baby change table is 100 cm high here. You are on Standard Toilet(s) (Blavatnik Building). Skip to the next section. The shared toilets that were surveyed are located on level 1 of the Blavatnik Building. 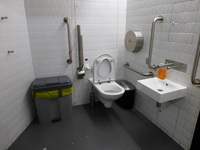 The shared toilet(s) is/are approximately 15m (16yd 1ft) from the Blavatnik Building entrance. Baby change facilities are located in the separate baby care room on level 1. 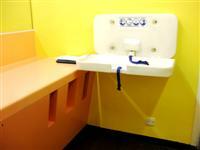 The height of the baby change table once extended is 91cm (2ft 12in). 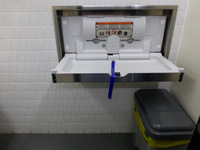 The first standard toilet cubicle on level 1 has grab rails to both sides for ambulant users (photograph 2). There are standard toilets on all floors. In some areas there are separate female and male toilets and other areas have shared 'all gender' facilities. Documents are available in Braille. The assistance dog toilet area is located on the grassed or paved areas around the building. Staff are trained to BSL level (unknown at time of research).